The General Representation of the Government of Flanders in the United Kingdom organises a yearly commemoration concert to remember the 'Great War', during which enormous human sacrifices had been made in Flanders Fields from 1914- 1918. The total number of military and civilian casualties in World War I was more than 41 million: there were over 18 million deaths and 23 million wounded, ranking it among the deadliest conflicts in human history. 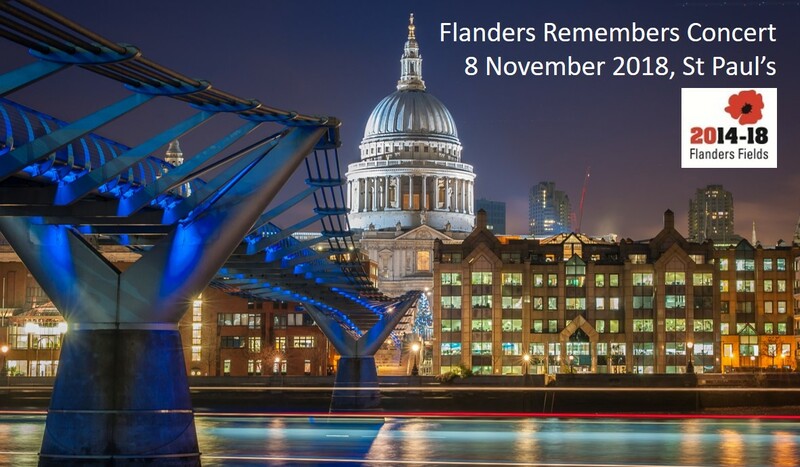 In partnership with St Paul’s Cathedral, we are hosting a unique edition of the annual Flanders Remembers Concert to commemorate the armistice that ended the First World War. This special concert will also provide an opportunity for Flanders to thank all our partners for the close and successful collaboration during the centenary of the Great War. Doors will open from 6pm at the west end of the Cathedral and we ask that guests are seated by 6:30pm.